Luckily for me, and for all who are interested in William Longfellow, his English ancestors were thoroughly researched and published way back in 1883. The researcher and author was G. F. Sewell who traveled to England and combed through the parish registers and trolled through wills of all the Longfellows he could find. He admits that he cannot absolutely link each generation and that he was "diffident" about printing his "proofs" but hoped that some other researcher could use them to find the documents which would prove a "perfect pedigree". No other researcher has come along with the perfect pedigree, so we have to make do with what he discovered, and that may be all we know about the Longfellows. So here is what he found about the Longfellows of Yorkshire. 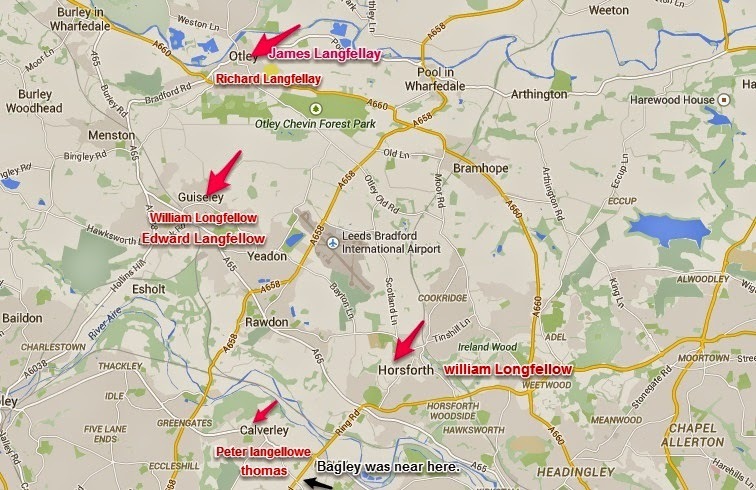 The Longfellow family was from an area in Yorkshire just to the north and west of the city of Leeds. The Longfellow name has been found in various villages such as Otley, Guiseley, Bagley, Calverley and Horsforth. These villages are all within a few miles of each other. The county of Yorkshire was divided into smaller administrative units called 'Ridings'. These villages were in the West Riding. The area was mostly agricultural in our Longfellow's time. Horsforth was recorded in the year 1086 in the great Doomsday Book of William the Conqueror. Today it and the other villages are part of the Greater Metropolitan Area of Leeds. 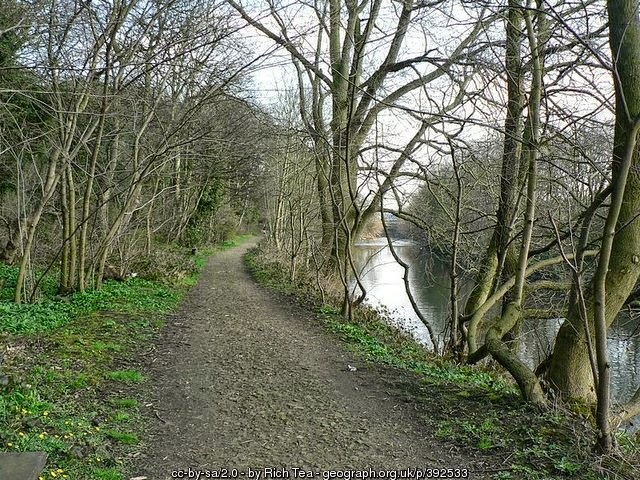 Sewell was able to find evidence of the Longfellow name in the Horsforth area as far back as the 15th century. The spelling of the name has evolved, sometimes spelled with an 'O' as in Long and sometimes with an 'A' as in Lang. The name seems to have originally ended in an 'Ley' or 'Lay'. The oldest Longfellow he discovered was one James Langfellay of Otley, Yorkshire. All we know of him is that he wrote his will on 18 June 1486 and died sometime before it was proved in York, a little more than a month later, on 28 July. In his will he named his wife Alice and John Langfellay as his executors. What was the relationship between James and John? Sewell guesses that they were brothers. Relationship to our William: Unknown. In about 1520 a John Longellay petitioned Peter Middleton Esq. to be admitted as a tenant to a small piece of land near Otley. In 1521 he was recorded in the Manorial records as being fined, along with 21 others, for taking "the lords's wood". The last record of this John comes from 1524 when he paid a day's wages to support King Henry the VIII's war against France. Nothing more is known of him. Sewell next found evidence of a Peter Langfellowe who was vicar of Huddersfield in 1508, of Calverley in 1510 and finally vicar of Leathley, near Otley, all in Yorkshire. This Peter was died and was replaced in 1530. Sewell surmised that all three Peters are the same man, but there is not definitive proof. Relationship to our William: Unknown. Next up is Richard Langfellay of Otley. He wrote his will in 1537. He left money in his will for the church at Otley and for upkeep and repair of the local bridge. Richard named his wife Elizabeth, but named no sons. Sewell guessed that he was the brother of Peter Langfellowe. Relationship to our William: Unknown. A third man, a contemporary of Peter and Richard, was William Longfellow of Leathley. In his will of 1540 he named Sir Richard Langfellay, his own wife Isabel and his son, Percival Longfellow. Percival was to receive his father's land in Bagley. William's will was proved in March of 1543/4. Relationship to Peter and Richard: assumed to be brothers. Relationship to Percival: proven to be his father. Relationship to our William: unproven. Was Isabel the mother of Percival, this is unknown. Percival Langfellow, of Bagley, wrote his will on 8 November 1577. He asked to be buried in the Calverley Churchyard and left money for the church. He named his son Thomas and left him a cupboard, a great chair and a pair of bedstocks. The rest of the household goods was divided up between daughters Jennet, Isabel and Elizabeth. No wife was named and no land was mentioned. Relationship to Thomas: proven to be his father. Relationship to our William: unproven. No birth or death record can be found for Thomas. He did have two sons baptized at Calverley. John on 19 July 1578 and Edward on 4 March 1582/3. This Thomas would seem to be the same as named in Percival's will. He was having children at the right time and lived in the same village. I have seen on Ancestry.com a wife named Elizabeth Gookin, but no one seems to have any source for this marriage. Some trees have her birth/death as 1544-1655 which would make her 111 at her death. This makes me just a bit suspicious, how 'bout you? Thomas' death record has not been found. Relationship to Percival: most likely his son. Known father to Edward. 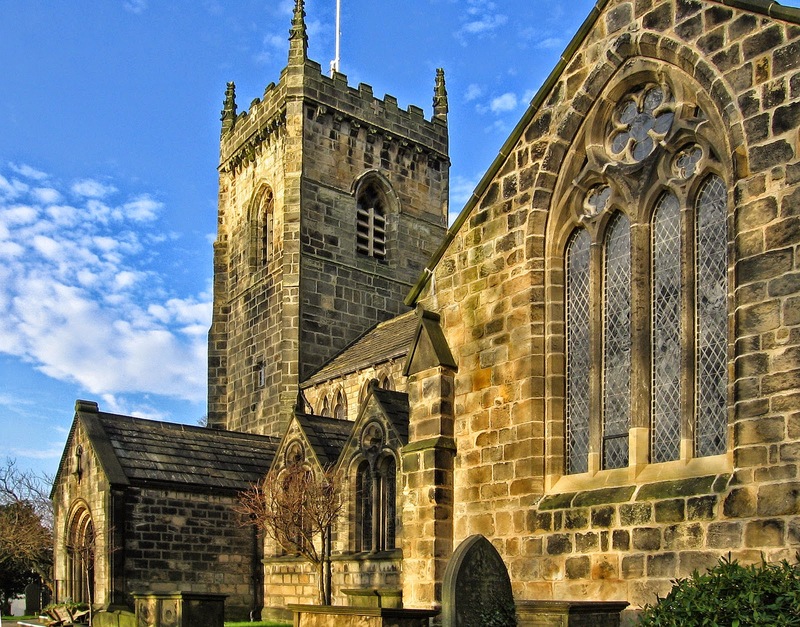 An Edward Longfellow took his daughter Grace to be baptized in the village of Guiseley on 18 Nov. 1621. Subsequent children were also baptized at Guiseley and William was named as their father. In 1619 a child named William Longfellow was baptized at Guiseley, but no parents were named. The researcher Sewell states that at that time, other children who were baptized had no parents name in the records. Sewell writes that he makes the assumption that Edward was the father of William based on the limited evidence at hand. As no other male Longfellow was baptizing children in Guiseley, it is most probable that the relationship is correct. When I looked for Longfellows baptized in Guiseley at that time I found not only William in 1619, but also Ane bp. 1613/4, Robert bp. 1615, Mary bp. 1617 and Elizabeth bp. 1624. Sewell did not identify Ane, Robert or Mary as siblings of William. I would think that if William was considered to be Edward's child, the others would have to be included in the family as well. Grace and Thomas, other siblings, were not baptized at Guiseley but at the Chapel at Horsforth. Now, at the same time our Edward was living in Guiseley, another Edward Longfellow and his wife Jane Harrison were living in Ilkley, Yorkshire. I have seem her name attached to our Edward but that is an obvious error. The name of our Edward's wife is not known. According to another source, Edward Longfellow purchased a house in Horsforth in 1625. The house, called "Upper House", was said to have been on or near Tom Royd Hill near Woodside. This was not the only property he bought. In a search of Access to Archives, I also found a 1623 mortgage for Edward Longfellow, Husbandman of Horsforth, he bought a messuage that included a barn, orchard, garden, as well as closes and a cottage. The purchase also include lands called Claverlands and Clay Flatts. In 1647, at the age of 65, Edward turned over his house and lands to his son William. No record of his death has been found. His wife's name remains unknown as is his date of death. This brings me to William Longfellow Sr., the father of the immigrant William. 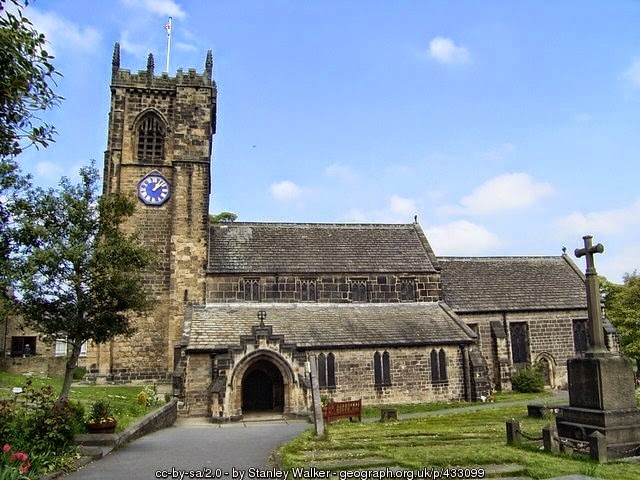 William, as I said was baptized on 24 Oct 1619 at St. Oswald's in Guiseley. Although his father was described as a husbandman, a man who farmed and worked the land, William learned a trade and worked as a clothier. A clothier was a maker of clothing. He must have been fairly successful as he bought multiple properties around Horsforth. On 10 Sept. 1646, at St. Wilfred's Calverley, William married Elizabeth Thornton. Although nothing is known about her, I find Elizabeth intriguing because my maiden name is also Thornton. My Thornton ancestors are said to have originated in Yorkshire. Could she be related to them? Who knows. William was recorded as having bought land at Clay Flatts from a Mary Thornton, was she her mother? A search of the freereg.org reveals that there were two girls named Elizabeth who were born in Horsforth in around 1628 that could possibly the wife of William. First there is Elizabeth d/o John, baptized 24 Feb. 1627/8, her father's name was John Thornton. A John Thornton married Susan Stringer on 25 November 1622. The second is Elizabeth also baptized in 1628 at Horsforth, her father's name was Robart. Unfortunately, without any type of document linking Elizabeth Thornton Longfellow to any potential father we are left with guesses. I have seen on ancestry.com a date of death in the year 1671. I can find nothing that would indicate that she died that year, or any other year, for that matter. Some of these ancestry trees also have William remarrying in 1671 to a woman named Ellen Walker. This is another bit of information for which I can find no proof or documentation. William wrote his will in July of 1704, he was buried on 25 July 1704. Elizabeth was not mentioned in his will nor were any children other than his daughter Isabel. We know that Nathan and William Jr. were dead and I guess that Sarah and Lucy had also died. No mention was made of William's grandchildren in Massachusetts. Longfellow, Wadsworth Henry and Alighieri, Dante, The Works of Henry Wadsworth Longfellow: With Biographical and Critical Notes of His Life, with Extracts From His Journals and Correspondences, Vol 14, Houghton-Mifflin, 1891, pgs 421-422. Cutter, Richard William, Genealogical and Personal Memoirs Relating to the Families of Boston and Eastern Massachusetts, Vol. 1, Lewis Historical Publishing Co., Boston, MA, 1908, pg. 92. Speight, Harry, Through Airedale from Goole to Malham, Walker and Laycock, Airedale, 1891, p. 94.